The Noble Quran is the speech of Allah, the Most High. It is a miracle from Allah sent to the Prophet Muhammad (ﷺ). It is divided into chapters. Each chapter is called a Sūrah (plural: Suwar), and there are 114 Sūrahs in the Quran. Each Sūrah consists of verses. Each verse is called an Āyah (plural: Āyāt). The Surahs are divided into two categories according to their revelation and subject-matter. 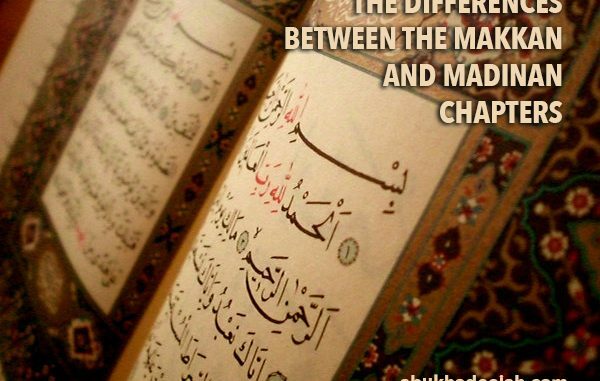 So the first category is referred to as the Makkan Chapters (Suwar Makkiyyah) and the second category as the Madīnan Chapters (Suwar Madaniyyah). Each of these two categories has specifics that distinguish it from the other. – Discern the abrogating verses from the abrogated. – Become acquainted with the dates of the revelation of particular laws. – To understand the context and the reason for the revelation of a particular Āyah or Sūrah. – To appreciate the greatness of the Quran in the lives of those early Muslims. – To recognise that Quran is not just to be memorised but truly understood. 1. 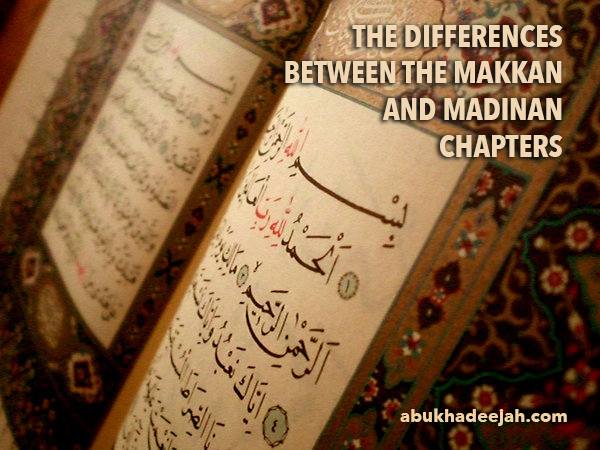 The Makkan Chapters are those which were revealed in Makkah. This refers to everything revealed before the Migration to Madinah, even if the verse was revealed while the Prophet (ﷺ) was outside of the city of Makkah. The Madīnan Chapters are those which were revealed in Madīnah. This refers to everything revealed after the Migration to Madinah, even if the verse was revealed while the Prophet (ﷺ) was outside of the city of Madinah. 3. The Makkan Chapters are those which were sent down to address the people of Makkah. The Madinan Chapters are those which were sent down to address the people of Madinah. That which is the most popular saying of the scholars is that the distinction between the Makkan and Madīnan verses is based on the time of revelation and not location. So this would indicate that the first definition is most correct. 1. The Makkan verses are distinguished by strength and sternness in addressing the people because the people would turn away and show arrogance, so this suited their state. Read for example Al-Mudaththir and Al-Qamar. The Madinan verses are gentler in approach and speech because most of the people were accepting of the message and submitting to it. Read Al-Mā’idah for example. 2. The Makkan verses are usually shorter, and are strong with their argument against the deniers (i.e. the idolators) and are appropriate to their condition at the time. Read At-Toor as an example. The Madinan verses are usually longer, and they mention the rulings and laws without debate because the condition of the people was appropriate for that. Read Al-Baqarah. 1. The Makkan verses predominantly explain and clarify Tawheed and the correct Islamic belief, specifically dealing with the Tawheed of worship and belief in the Resurrection because most of those being addressed denied these affairs. The Madinan verses, in general, discuss the details of worship, interaction and dealings because those addressed have Tawheed and Aqeedah established in their souls – so they are in need of detailed rules related to worship and dealings.